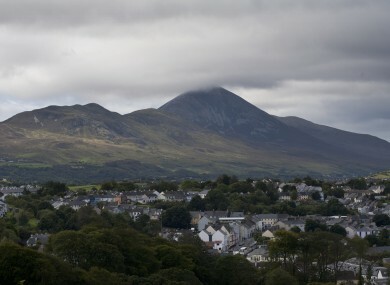 HUNDREDS OF PEOPLE have ignored warnings not to climb Croagh Patrick today, with ten needing treatment for hypothermia. Earlier today, gardaí confirmed that Croagh Patrick’s annual Reek Sunday pilgrimage had been cancelled. Met Eireann then issued a yellow weather alert for today until 3pm forecasting heavy rain. That led to the climb being cancelled, but hundreds ignored that warning and traversed up the peak regardless. Many are believed to have been forced to turn back and Mayo Mountain Rescue Team confirmed to TheJournal.ie that ten people have been treated for hypothermia. Due to the adverse weather conditions on the County Mayo mountain the pilgrimage had been called off, with gardaí saying the conditions are unsafe for climbers today. Every year, thousands of people climb the mountain in pilgrimage, some even barefooted. Mass is said at the top of the mountain. It’s believed the mountain rescue tents were blown down over night and the structure for Mass on the top was also blown away. The pilgrimage schedule has been transferred to Lecanvey Church a mile past Croagh Patrick. The pilgrimage is traditionally held on the last Sunday in July. Around 13 volunteer mountain rescue teams from all over the country are in the area were due to be involved in today’s operation. Email “Hundreds ignore warning not to climb Croagh Patrick, ten get hypothermia”. Feedback on “Hundreds ignore warning not to climb Croagh Patrick, ten get hypothermia”.